This is not a post about the barrier I came across as I walked to the post office on Saturday. I had to turn into the path in the picture, which takes a 210° hairpin to the right, followed by a 110° turn back to the left – it’s sharper and more awkward than the picture makes it look. A moment’s trivial inconvenience, a moment of minimal exasperation, and on I went – as no doubt does everybody else who needs to go that way. I am going to assume – perhaps generously – that whoever decided to put it there did not do so with the express intention of creating an unnecessary obstacle for pedestrians. But if not that, then why? The obvious explanation is that it is there to discourage cyclists from using the path as a short cut, and for all I know, it succeeds at that perfectly. But that’s not an answer to the much more interesting question of whether the existence of the barrier is a good thing. Effectiveness is the easy one. If it is designed to discourage cyclists, does it in fact discourage cyclists? The fact of the obstacle is indisputable. It’s not impassable, because there is a necessary trade off with pushchairs and wheelchair users, but it’s probably enough to be mildly discouraging. Externalities are reasonably clear too. The fact that I am bothering to go on about this at all is an indication that there are some. Even I couldn’t argue that they are big for any single pedestrian. Whether they are cumulatively bigger than the cumulative benefit of discouraging cyclists is another matter. Since whatever cyclists there might have been have been discouraged, it’s hard to tell. That gets us to harm avoided. How bad would it really be if the cyclists were not discouraged? I have a feeling that the answer may well be, “not very”. That’s partly because similar barriers which get in the way of where cyclists actually want to go seem to have no effect whatsoever (I say that with no malice – this is not a post about, let alone against, cyclists – merely as an observation), and partly because in only a few yards (only to the end of the railings on the left) of shared use of a wide path, the scope for conflict should be limited. Since only a small proportion of the readers of this blog can be supposed to have an obsessive interest in the minor footpaths of south London, that’s probably more than enough on that. The real question, of course, is what this might tell us about some bigger and less obvious problems. I think it’s the last of the three factors which most often trips up decision making. If the problem is assumed to be big, the solution will tend to be big too. And even if the problem is big, it is not unusal for it to have been made big by something which is treated separately. So, to take another local environment example, the road where I live has speed humps to slow the traffic down. But it only needs slowing down because the installation of traffic lights sped it up. So step one should be, is the problem as big as it looks? Step two then becomes, can we make the problem smaller? That leaves as step three, is the problem now small enough that we can accept the risks it carries because of the positive externalities? Reflecting further on my own recent post reinforced by some thoughts from Lost ConsCIOusness, I wonder how far skewed outcomes are a result of looking too much at effectiveness and too little at harm avoided and externalities. If the size of the problem is exaggerated, purported solutions to it will be disproportionate. And if the costs of the solution fall on users of the service or on random passers by, there is no incentive to reduce them. Another interesting post. It would be interesting to contact the council responsible for the posts to see what problem it intended to solve. If you have a bike you could just lift it over so it is not solving a problem with bikes. 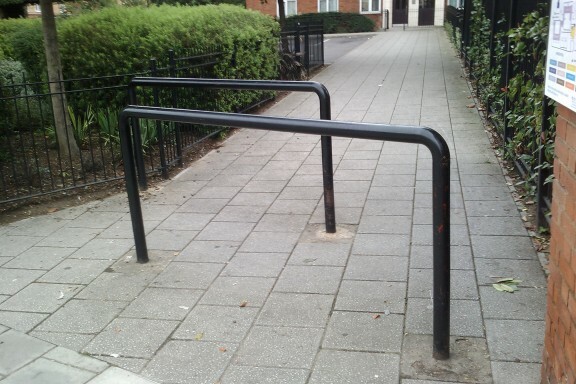 It is a barrier for wheelchairs and pushchairs so maybe this is the menace it is intended to resolve.